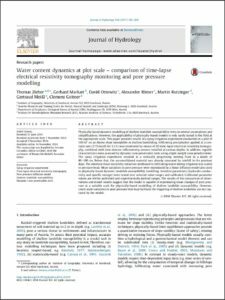 A new open-access publication in the journal 'Natural Hazards and Earth System Sciences' is now available here: http://www.nat-hazards-earth-syst-sci.net/17/971/2017/ Many thanks to all the co-authors for the support! 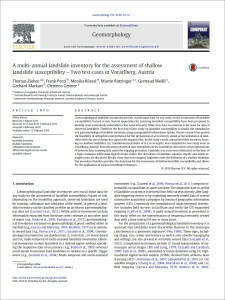 A new open-access publication in the journal 'Landslides' is now available online: link.springer.com/article/10.1007/s10346-017-0840-9 Special thanks go to Barbara Schneider-Muntau and Martin Mergili for their support! The results of the project C3S-ISLS were presented to the public at a user oriented workshop 'Contributions of Hydrogeology and Subsurface Investigation to Analysis and Prevention of Natural Hazards' in the frame of the IHG (Innsbrucker Hofburggespräche). The workshop took place at CONGRESS-Innsbruck on 6 April 2017. Results were presented by the project partners to more than 100 researchers and practitioners. The contributions can be found here. Preliminary results of the C3S-ISLS project were presented at the 17th Austrian Climate Day 2016 in Graz. The presentation can be accessed here. 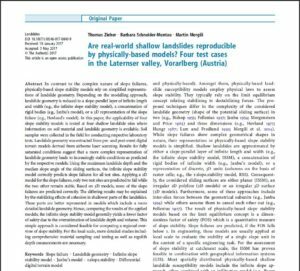 In Austria shallow landslides are usually triggered by prolonged, intense rainfalls. The Figure below shows a comparison of the number of landslides mapped in the respective orthophoto series for the Laternser valley (Vorarlberg, Austria) with the two-day precipitation sum of the station Innterlaterns in the centre of the valley. At least for the landslides mapped in the orthophoto series of 2001 and 2005 it is known that they were triggered in May 1999 and August 2005 respectively during extreme rainfall events exceeding 250 mm/2d. 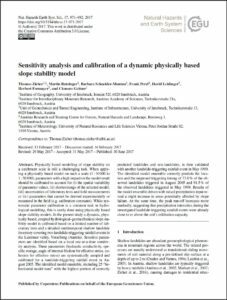 As a first step of any study on landslide susceptibility, hazard or risk a landslide inventory is compiled. 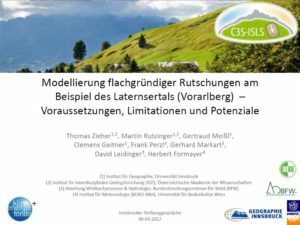 In the project C3S-ISLS an inventory focussing on shallow landslides was prepared for the study areas Laternser valley, Kleinwalser valley and the communities Au and Schnepfau in Vorarlberg (Austria). In total more than 2300 shallow landslides have been mapped based on nine sets of high-resolution orthophoto series aided by derivatives of two airborne laser scanning campaigns. The figure below shows an overview of the landslides mapped in the study areas on top of the tectonical map (available on onegeology.org). Especially in the Kleinwalser valley the high susceptibility of the Flysch formation is apparent. Last week I joined Prof. Seijmonsbergen (University of Amsterdam) and his group of students in an excursion on geomorphology in Vorarlberg. Landforms originating from late-glacial ice decay, processes occurring during the Holocene as well as more recent activity were discussed. The area around Au/Schnepfau was treated in particular detail. Thank you for the inspiring trip!